The long-awaited new Änglagård single has finally hit the shelves as part of the latest Ptolemaic Terrascope magazine. 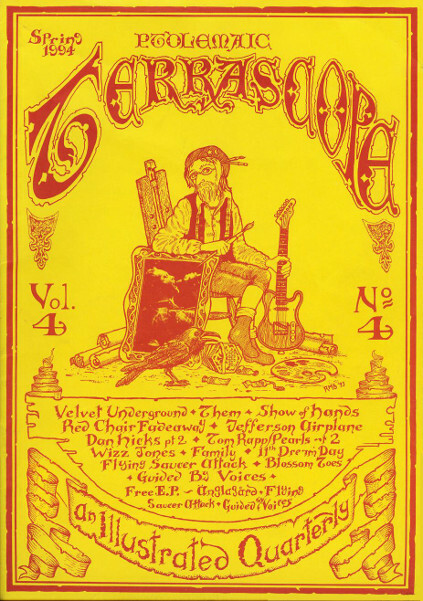 In each issue (a grass-roots psychedelic/underground offering published in the UK), a 7" single of a featured artist is included. Hearing Änglagård on the vinyl is quite a surprise as they seem far from the scope of the Terrascope. "Gånglåt från Knapptibble" is the seven minute new piece played on their December '93 North American tour. Fans of Hybris will not be disappointed, as this track is largely in the same style of the four found on that CD: heavy on the Mellotron and analog keys, very strong drumming, and wickedly complex time changes. The track consists of a Genesis-like acoustic guitar, flute and keyboard interlude sandwiched between a slightly RIO-ish main riff. "Gånglåt" features vocals as well. Compared to other Änglagård tracks, this one seems to end just as it is getting started, but it contains many of the elements that made Hybris popular. In the same sense, the band breaks very little new ground, though to this listener the twisted feel of their writing on this track is very welcome. With rumors of them doing "something different" on their second album due this fall, as well as stories of their imminent self-destruction, I can only hope that whatever they do next has less of a retro feel and more of the complexity featured here. In any case, fans of Änglagård are likely to eat this up, despite the weak pressing which makes the pops and clicks louder than the band.